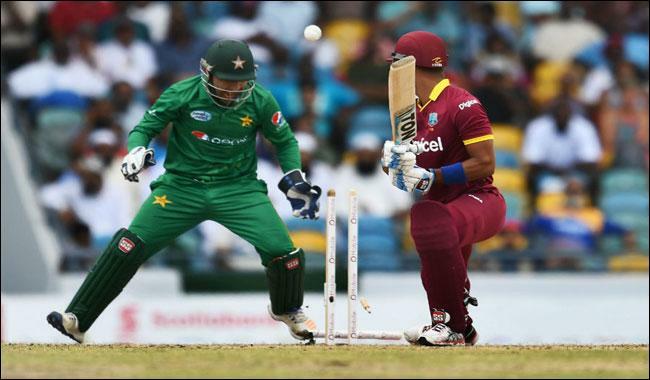 West Indies' hopes of earning a series draw with Pakistan were boosted with a seven-wicket win in the third T20 global in Trinidad, on Saturday. Needing victory to keep interest in the series alive ahead of the final match on Sunday, West Indies made one change. Lewis smashed an incredible nine sixes in his innings which was devastating from the get go and he would play leg spinner Shadab Khan especially well even if he did eventually hole out to him. Lewis came off to spectacular effect and had seen the West Indies draw within four runs of the target in just 14.3 overs before he was caught at long off. Earlier, there was an eventful start to the Pakistan innings, when Ahmed Shehzad swung the very first delivery of the match from Badree to the deep backward square leg boundary for four. Bardree was the pick of the West Indies bowlers with two wickets. Two balls later, Badree struck again, when left-hander Imad Wasim, promoted to three, reached for a delivery outside the off-stump, lost his balance and was stumped for a duck to leave the visitors four for two. Babar Azam's civilised knock of 43: Apart from Akmal, it was also Pakistan's middle-order batsman Babar Azam, who played a civilised knock of 43, and therefore being the second shining star for the Pakistan batting. Needing victory to keep interest in the series alive ahead of the final match on Sunday, West Indies made one change with batsman and occasional off-spinner Jason Mohammed making his T20 worldwide debut at the expense of all-rounder Rovman Powell. The West Indies bowlers continued to leak boundaries before Babar brought up the 50 partnership with a single to fine leg off Sunil Narine in the eighth over. The next ball, new batsman Lendl Simmons hit the winning boundary. Lewis added a vital 56 run stand with Samuels (18) and another 76 run stand with Jason Mohammed (17 not out) to take West Indies to the course of win, which they completed in the 15th over.